Content marketing, in our humble opinion, deserves the bundles of praise heaped upon it. While traditional marketing pushes information at you, content marketing pulls you in, showing you branded and relevant information through storytelling. When storytelling is visual, it’s even more effective. Visual storytelling, done well, increases engagement, explains and summarizes complex information, speeds up comprehension and creates an emotional connection. Illustrated videos are a terrific place to put video storytelling techniques to work for your brand. But, creating a good illustrated video isn’t an easy task. So we wanted to walk you through the process, taking you step-by-step from conception to completion. You have a challenge. Maybe your new product is difficult to explain, maybe your donors have stopped responding to Appeals, and maybe you want journalists to pay more attention to your brand. So, being the top-notch marketing/PR guru you are, you host a brainstorming session. Once you nail down key messages, budget and timeline, you decide an illustrated video is the way to go. You’re on your way! Drafting a script and getting approval on messages from key stakeholders is the first step. While a vendor may be involved with this process, ensuring your brand voice and messages are reflected in the script is a must. It’s also best to keep it short and snappy, a minute or two is best. A good vendor will be very involved in storyboard ideas, likely delivering one or two concepts and collaborate on ensuring that your script and storyboard work well together. At this stage, both should flexible enough to adapt to challenges you’ll face as the project moves forward. When we work with clients on illustrated videos, we deliver two storyboards along with two illustration style options (assuming the brand doesn’t already have this). A good illustrator will offer up options that reflect the brand’s style, incorporating colors, typography and a look that is brand appropriate and evocative. A very rough voice over is laid down with the script and accompanied by static images from the storyboard. The animatic can include anywhere from 20-40 stills, depending on the length of the script and the complexity of the storyboard. 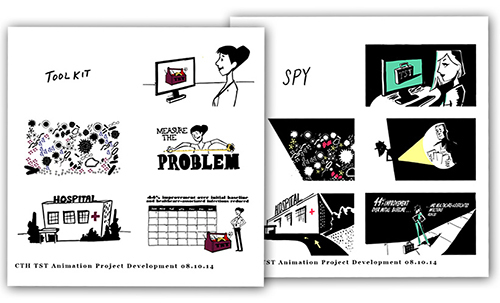 The goal of this step is to unearth problem spots, such as places where the storyboard has too little, or too much, action to carry the script. In other words, this is where you make sure the visuals and audio are aligned and neither has gaps. Once the animatic is approved, and any trouble spots re-storyboarded and/or re-scripted, it’s time to make sure all stakeholders approve every word of that script. Then the voice over is recorded as a single reading so it’s smooth and consistent. Once the Voice Over is recorded, revisiting the final recording can trigger major costs, often requiring illustrator to redo work to match new VO timing, so spending the time to get it right at this point can keep your budget intact. Generally, there are approximately two passes, which means the illustrator creates the illustration, timed with the final voice over, in several steps, each increasingly polished and detailed. Details such as transitions, not easily represented in the animatic stage, are nailed down as the illustrator works through each elements of the storyboard. You may run into a few small issues at this stage that weren’t fleshed out from the animatic, but a good illustrator can adapt and help you update as needed. With all the illustration in place, the final pass will polish off elements such as facial expressions, ensuring motion is fluid and the final product flows seamlessly through scenes and action. Its also during this final pass that sound effects will be added, creating another way to make your illustrated video more engaging. There you have it. You’ve walked through the procedure and now know what the process entails, making you one step closer to creating a branded illustrated video. What an outstanding tool for telling your brand story in various settings, across numerous platforms, and with multiple audiences!